Television would seem to exert a unique influence on modern religion, boosting the careers of charismatic preachers like T.D. Jakes and Joel Osteen who bring the “gospel of success” right into people’s living rooms. But in fact technology started exerting pressure on religious messages as long as a century ago, in a totally different medium — as the remarkable story of black religious recordings in America shows. The Great Migration of the early 20th century, when African-Americans moved to cities in droves, changed many aspects of black life in America: factory jobs replaced farm jobs, dance halls became a new kind of entertainment center, the church lost the central role it had occupied in rural communities, and black factory workers had disposable income, often for the first time. This meant, among other things, they could afford to buy records. 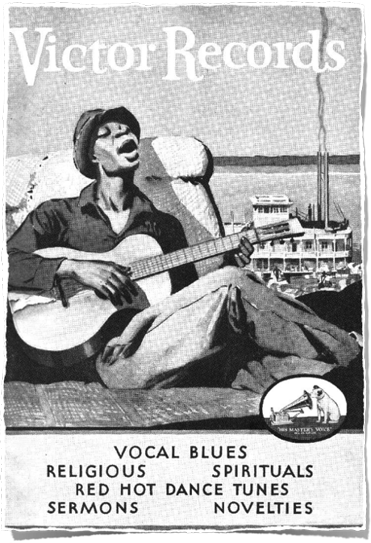 Major record labels like Columbia, Victor, and Paramount eagerly catered to this new market, with blues and jazz records — and also recorded sermons from prominent black preachers. The first preacher to really achieve fame on the phonograph was Reverend James Gates, who moved from rural Georgia to Atlanta in 1913. “Folks could play these sermons on the phonograph and hear home,” Martin says. “[Gates’s] sermons are reflective of the rural church background, with a stage congregation that says ‘amen’ and ‘preach,’ ” Martin says. The phonograph allowed black preachers to reach large audiences, but at the cost of restricting the topics they could preach about. 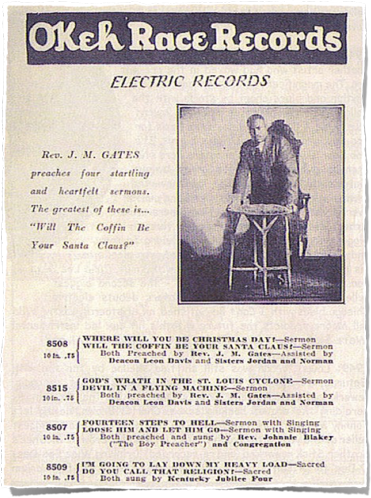 Preachers like Gates depended on big companies to produce and distribute their records; in 1930 Gates preached a two-part sermon against the evils of chain stores like J.C. Penney and Sears, stores that also happened to sell many of his records. His label, OK Records, decided not to release the sermon. Instead of social critique, recorded sermons tended to focus on what Martin calls “self-actualization and individual flourishing” — how to be a better you and life a fuller life. The “preaching on wax” era ended after World War II, with the rise of the first black radio stations. But even as sermons migrated to the airwaves, and later to television and podcasts, the same dynamic held.